Take your business to new heights online. The Internet has exploded the seller’s market wide open. Now, anyone can sell their product to a prodigious audience with little more than a product, web site and computer. There is no longer a need for a brick and mortar store, a warehouse full of inventory or a full team of employees to handle it all. However, the one thing you do need to have, no matter where your “store” is or the size of it, is a Merchant solution for processing payments. 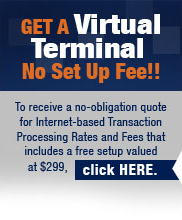 Veritrans has a variety of solutions to help you deal with any sales and payment matter your business may encounter. We can show you how to accept credit cards, debit cards and checks by phone or online. Our Quick Start Program can have your business online and able to accept online payments in as little as 24 hours. We can help you quickly setup an account whether you are a single merchant or a Fortune 500 company. From easy-to-read monthly statements to the latest in processing technology, Veritrans is a full service processing company with your company’s best interest in mind. Call us today at 1-866-474-4144 or contact us online at info@Veritransllc.com to get on the road to a profitable web presence.